Creatine Crash Course: What is The Best Creatine Form? How does creatine work and which form is actually best? It doesn't matter how old you are or how long you have been training. we've all had that moment where our grandma or mom gets a look at our supplement cabinet. They instantly raise an eyebrow and begin to worry about what we are taking. This is usually followed by a talk where they say they think you are taking this "weightlifting thing" a little too far. It makes sense that they are worried though. They have no clue what any of these supplements are. To them is it is nothing but mysterious powders, potions, and pills. Their lack of knowledge can make your supplement arsenal appear to resemble Frankenstein's lab. It's easy for us to shake our head and laugh at their confusion but don't be so quick to joke. There are many areas that I find lifters and even serious bodybuilders are still very confused. Creatine is one such subject. Despite being the most researched and proven supplement on the market creatine is surrounded by myths and questions. Even in my work with elite bodybuilders, I find many don't truly know how creatine actually helps with growth or what type of creatine is actually best. Let's clear some of that up right now! 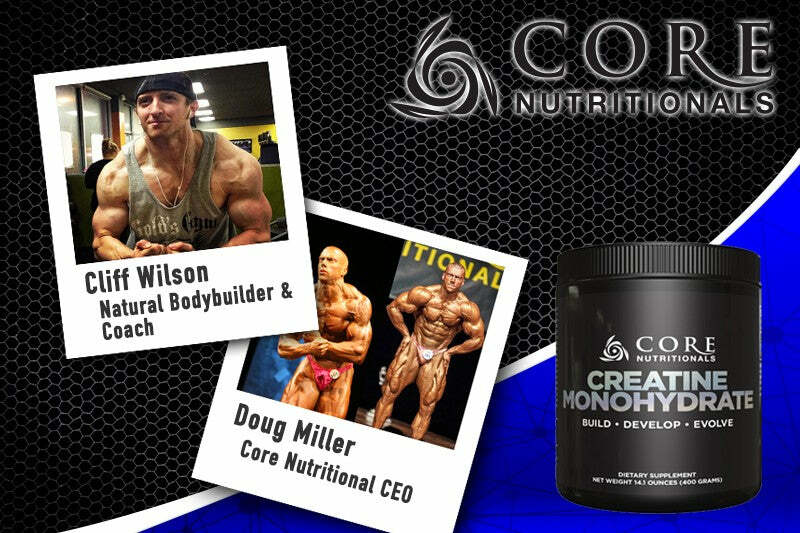 Click here to purchase creatine monohydrate from Core Nutritionals. What is creatine and how does it work? Some people are still skeptical about whether or not creatine actually works. Some are quick to say that the gains are false because it "just makes you hold water." Others will say that it only helps with strength. The truth is that creatine is quite the multi-tasker that can help with growth and strength on many levels. In order to understand how valuable this supplement is, you have to first understand how it works. Adenosine tri-phosphate (ATP) is the energy source used by muscle cells to fuel muscle contraction. ATP is broken down and a phosphate is released along with adenosine di-phosphate (ADP). The ADP will be recycled as a phosphate will be reattached and ATP is formed again. The mitochondria of each cells are charged with the job of energy production. The mitochondria convert glucose, fatty acids, and ketones into ATP through the Krebs Cycle or TCA cycle. Creatine interacts with an enzyme process called creatine kinase (CK) where it picks up a phosphate molecule and becomes creatine phosphate also called phosphocreatine (CP). Creatine kinase will then remove the phosphate molecule from CP and it is donated to ADP to create ATP. Beyond this point, the phosphocreatine system still provides energy but just to a lesser degree and continues to decrease as exercise continues. Creatine is effective at improving high-intensity efforts that are less than 30 seconds in duration because, at this intensity, fatigue is caused by an inability of Type II fibers to maintain the high rate of ATP resynthesis that is required to maintain a high power output. So as you can see, creatine is WITHOUT A DOUBT an effective supplement that offers benefits to athletes and physique athletes through several mechanisms of action. There is a reason that creatine is the most researched supplement there is on the market. It has been proven to work, time and time again, and offers advantages that are multifaceted. 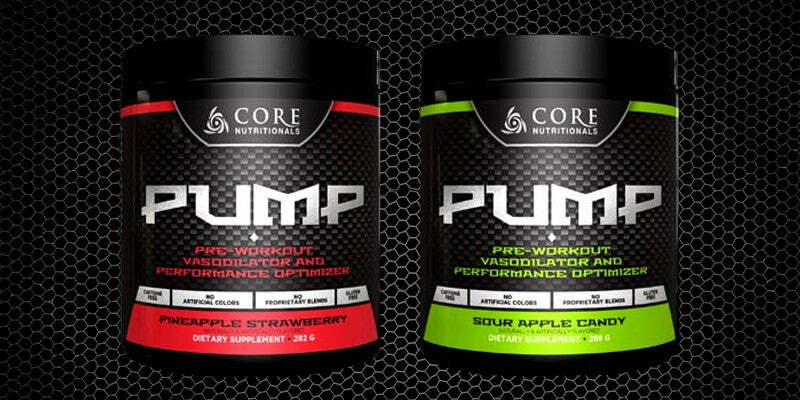 Core Nutritionals Core Pump is a pre-workout vasodilator and performance optimizer that stacks perfectly with creatine monohydrate. Order now. This is where many people get lost. It seems that every few months there is a new "advanced creatine" that is hitting the market. They all have some amazing adjective and adverb laden name like "Super Mega Ultra Advanced Creatine Delivery Technology Breakthrough". All the marketing for these different forms claim to be the best, and all tell you that they have the scientific research to back it up. Well, let's get down to the nitty gritty and see what the research really says about some of the more popular forms of creatine. Creatine monohydrate is possibly the most researched supplement in history. Time and time again it has been proven effective and safe. It has become the standard against which all other creatines are judged. It is rather inexpensive making it an excellent supplement option even for those on a budget. Creatine nitrate is creatine that has been bound to a nitrate group. Creatine nitrate has been found to be about 10x more soluble than creatine monohydrate which may allow it to cause less gastric distress to those that sometimes experience stomach issues with regular creatine monohydrate. However, the claims of creatine nitrate being more effective for increasing strength or power have not been shown to be true. Creatine ethyl ester is commonly called an "advanced creatine" and that it "increases uptake" over standard creatine monohydrate. It is funny that this is the common marketing claim because the truth is that creatine ethyl ester rapidly degrades into the metabolite creatinine in the intestines, almost completely in fact. Therefore making it FAR LESS effective than its cheaper counterpart creatine monohydrate. This is an extremely ineffective supplement. don't waste your money on this. This is also known as Buffered Creatine. The buffer is actually sodium bicarbonate, more commonly known as baking soda. The marketing claim for buffered creatine is that you don't have to take as high dosages as regular monohydrate because more of the product will pass through the stomach and GI tract through less degradation. Unfortunately, Kre-Alkalyn is negated by stomach acid and turns into a basic creatine molecule. This makes Kre-Alkalyn no more effective than regular creatine monohydrate. In fact, one study even showed Kre-Alkalyn less LESS effective at promoting changes in muscle creatine content than regular creatine monohydrate. This is a little disappointing when you consider it is also more expensive. There is some research that shows creatine magnesium chelate enhances uptake of creatine into muscle cells as well as intracellular water. However, at this time any performance benefits are still yet to be shown. Creatine Hydrochloride is typically marketed as being more soluble and also absorbs more rapidly in the GI tract. While it is true that hydrochloride typically bound to amines will have these abilities, this has not yet been proven to be the case with creatine HCl. There are as of yet no studies to show superior absorption of creatine HCl or improved performance. Which Creatine Form is Best? As you can see from reading the list above, many of the so-called "advanced creatine" products are not so advanced after all. While creatines like creatine nitrate may ease gastric distress for the few that have this issue, and magnesium chelate can enhance intracellular water, at this time there is no reason why you should use anything other than good old creatine monohydrate. None of the other formulations have outperformed creatine monohydrate in terms of a performance aspect and all of the claims of poor absorption of creatine monohydrate are not accurate. Creatine monohydrate has clearly been shown to clear the stomach to be absorbed intact. I know you are probably thinking, "You made me read all that just to recommend boring creatine monohydrate?" Well, now you know the truth behind all the fancy claims of each product. Creatine Pills, Powders and Liquids? OH MY! One last thing to consider in your choice of creatine is whether to buy it in the form of pills, powder, or liquid. Here are some things to consider. Creatine powder is often cheapest, it mixes easily, and most forms have no taste at all (unless it is flavored). This is a very good form to buy as you can easily add it to many beverages or just drink it alone. To get an effective 5-gram dose it is typically only 1 heaped teaspoon. Creatine capsules have the advantage of traveling a little easier if that is of use to you. They are equally effective as the powder. Sometimes pills can cost a bit more than powder, but not much more. The only other downside is that commonly it will require taking 3-5 pills to equal a 5 gram dose. For those that don't like taking a lot of pills, this is not a good option. STAY THE HECK AWAY FROM LIQUID CREATINE! Given the fact that creatine is unstable in aqueous solution and will eventually degrade into worthless creatinine, I find it very disturbing that companies would actually sell liquid creatine. It is often claimed that this enhances absorption but the truth is that by the time you take liquid creatine, it has more than likely completely degraded into creatinine. And If You Don't Know - Now You Know! There you have it! Your crash course on creatine is complete. You are now equipped to go out into the world and handle flashy advertising, creatine myths, and skeptical grandmas. 1) Bangsbo J, Graham TE, Kiens B, Saltin B. Elevated muscle glycogen and anaerobic energy production during exhaustive exercise in man. J Physiol. 1992;451:205-27. 2) Boulay MR, Lortie G, Simoneau JA, Hamel P, Leblanc C, Bouchard C. Specificity of aerobic and anaerobic work capacities and powers. Int J Sports Med. 1985 Dec;6(6):325-8. 3) Sargeant AJ. Structural and functional determinants of human muscle power. Exp Physiol. 2007 Mar;92(2):323-31. Epub 2007 Jan 25. Review. 4) Saks VA, Kongas O, Vendelin M, Kay L. Role of the creatine/phosphocreatine system in the regulation of mitochondrial respiration. Acta Physiol Scand. 2000 Apr;168(4):635-41. 6) Bangsbo J, Krustrup P, González-Alonso J, Saltin B. ATP production and efficiency of human skeletal muscle during intense exercise: effect of previous exercise. Am J Physiol Endocrinol Metab. 2001 Jun;280(6):E956-64. 7) Maughan RJ, Gleeson M, Greenhaff PL. Biochemistry of exercise and training. Oxford: Oxford University Press, 1997. 9) Deldicque L, Atherton P, Patel R, Theisen D, Nielens H, Rennie MJ, Francaux M. Effects of resistance exercise with and without creatine supplementation on gene expression and cell signaling in human skeletal muscle. J Appl Physiol. 2008 Feb;104(2):371-8. 10) Saremi A, Gharakhanloo R, Sharghi S, Gharaati MR, Larijani B, Omidfar K. Effects of oral creatine and resistance training on serum myostatin and GASP-1. Mol Cell Endocrinol. 2010 Apr 12;317(1-2):25-30. 12) Greenwood, M; Kreider, R; Earnest, C; Rasmussen, C; Almada, A. Differences in creatine retention among three nutritional formulations of oral creatine supplements. Journal of Exercise Physiology Online . May2003, Vol. 6 Issue 2, p37-43. 7p. 14) Child R, Tallon M, Creatine ethyl ester rapidly degrades to creatinine in stomach acid. Abstract presented at 4th annual conference of the ISSN 2007. 15) Spillane M, Schoch R, Cooke M, Harvey T, Greenwood M, Kreider R, Willoughby DS: The effects of creatine ethyl ester supplementation combined with heavy resistance training on body composition, muscle performance, and serum and muscle creatine levels. J Int Soc Sports Nutr 2009, 6:6. 16) Deldicque L, Décombaz J, Zbinden Foncea H, Vuichoud J, Poortmans JR, Francaux M. Kinetics of creatine ingested as a food ingredient. Eur J Appl Physiol. 2008 Jan;102(2):133-43. 17) Jagim AR, Oliver JM, Sanchez A, Galvan E, Fluckey J, Riechman S, Greenwood M, Kelly K, Meininger C, Rasmussen C, Kreider RB. A buffered form of creatine does not promote greater changes in muscle creatine content, body composition, or training adaptations than creatine monohydrate. J Int Soc Sports Nutr. 2012 Sep 13;9(1):43. 18) Brilla, L. R., et al. "Magnesium-creatine supplementation effects on body water." Metabolism 52.9 (2003): 1136-1140. 22) Wu, J., Wu, Q., Huang, J., Chen, R., Cai, M., & Tan, J. (2007). Effects of L-malate on physical stamina and activities of enzymes related to the malate-aspartate shuttle in liver of mice. Physiological research, 56(2), 213. Next article Ultimate Protein Blend War: Which Brand is King?